Albert Pujols is the superstar 1B for the Los Angeles Angels. Prior to joining the Angels, Pujols became a legend with the St. Louis Cardinals, where he totaled 445 home runs, was a nine-time All-Star and led St. Louis to two World Series victories (2006 and 2011). This past offseason, Pujols was baseball's biggest free agent since Alex Rodriquez was available on the open market in both 2007 and 2000. Many people thought Pujols would stay in St. Louis, but at the last minute, the Angels offered a whopping 10-year/$254 million contract, which he later signed. The signing of Pujols brought a significant level of excitement to Southern California and the Angels fan base. However, going into Friday's game against the Texas Rangers, Pujols has struggled. The future Hall of Famer has hit only one homerun, while batting a dreadful .198 so far this season. Prior to hitting his lone homerun of 2012, Pujols had a career long drought of 110 at-bats without a long ball. Despite some of his early struggles in the American League, Pujols is still immensely popular and very recognizable throughout the country. Above is an iFolloSports.com original photo of Pujols entering an SUV, outside of the W Hotel Minneapolis, a few hours before the Angels defeated the Minnesota Twins 6-2. 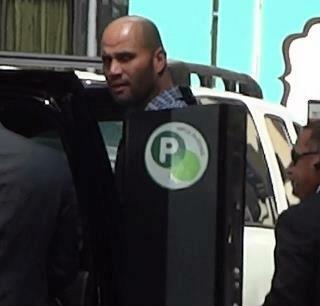 Pujols was escorted by a security official and the driver of his chauffeured vehicle.